The personalised service and unique style of this secluded Okavango Panhandle lodge showcases the Okavango Delta's renowned beauty and astonishing birdlife. Lodging: 6 double en-suite chalets with decks overlooking the water. Intimate and stylish, this Okavango Panhandle Lodge in Botswana is surrounded by water and protected by indigenous forest. Wonderfully peaceful and private, this is a prime fly-fishing and birding destination where guests can't help but relax in such a verdant setting. The site of Nxamaseri Island Lodge was selected for its great natural beauty and seclusion. 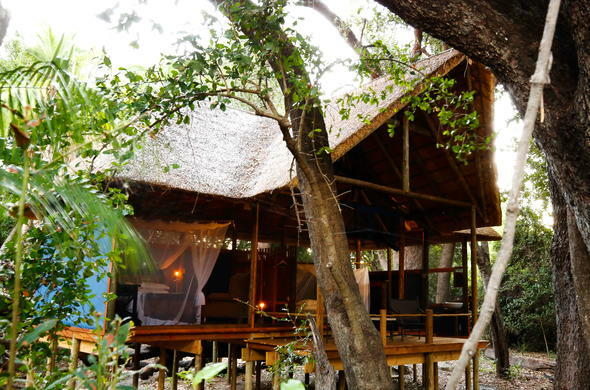 An original Okavango Panhandle Lodge, Nxamaseri is the only one of its kind in the Panhandle. The focus of the lodge is on attention to detail, fabulous food and exploring the lush waterways and sacred Tsodilo Hills. Only semi-aquatic animals can survive in this environment amongst prolific birdlife - at least 350 of 500 species found in Botswana live here. The owner of Nxamaseri Island Lodge is a pioneer of fly-fishing in Botswana and guests can enjoy this or tiger and bream fishing adventures from shore or by boat. Other activities include excursions in a traditional dug out canoe, guided walks and fabulous birding safaris. After a day of fly fishing, mokoro game drives or guided walks in this area of the Okavango Dleta, spend the night relaxing around the camp fire at Nxamaseri Island Lodge. This unique lodge in the Okavango Panhandle, Okavango Delta, Botswana, offers privacy, great service and local artwork. It is surrounded by indigenous forests, waterways and rivers and close to the San Rock Art paintings at Tsodilo Hills.